Meanwhile, some scientists say that the 35-year eruption from the Pu‘u &Omacr;‘&omacr; vent has ended and that the flows since 3 May are a new eruption. Others take issue with this view. Earthquake activity soared at the summit of Kīlauea this past weekend, with seismologists detecting around 500 temblors in a 24-hour period, the highest rate ever recorded at the volcano. U.S. Geological Survey (USGS) scientists had previously reported on Friday that 67 earthquakes with a magnitude of 3.0 or greater shook the summit in the past week, the highest weekly number of quakes of such magnitudes ever recorded. Although the earthquakes were highly localized and not widely felt outside of Hawai‘i Volcanoes National Park and the nearby village of Volcano, they caused intense shaking within that area, damaging the USGS’s Hawaiian Volcano Observatory facility on the rim of Kīlauea caldera to the point that the skeleton crew that had been manning the site could no longer remain. There was “heavy cracking and offsets in the floors as well as the walls, heavy furniture and appliance-like objects getting thrown over and moved around,” USGS seismologist Brian Shiro said Sunday, speaking for the USGS at a news briefing. “So the shaking is quite intense up there, and it’s not a safe workplace, which is why we’re no longer there.” The University of Hawai‘i had previously announced, on 28 May, that it was providing a temporary base to USGS personnel at its campus in the town of Hilo, a 45-minute drive from the volcano. The seismic surge occurred as explosive eruptions at the volcano’s summit slowed down, USGS reported, although scientists warned that more blasts, which could be bigger ones, could occur at any time. The pattern of explosive activity that started on 17 May had begun to settle down around 10 days later, Shiro said. The eruptions of steam and ash became less regular, whereas earthquakes increased in frequency. One interpretation of the change could be that large amounts of rubble that have fallen into the summit vent may be suppressing the explosions, he said. “When the explosions do eventually get out, they could potentially be larger,” he added. Shiro delivered other news Sunday that may deepen the historic significance of the new series of lava flows that have been making headlines since early last month. After more than 35 years during which Kīlauea has spewed lava from a vent called Pu‘u Ō‘ō, about 11 kilometers northeast of the volcano’s summit, some agency scientists have proposed that the flows in the lower east rift zone, in the midst of a residential subdivision known as Leilani Estates, are truly something new, according to Shiro. That novel set of flows, occurring about 22 kilometers northeast of Pu‘u Ō‘ō, “is its own eruption,” he said, noting that by contrast, the Pu‘u Ō‘ō outpouring, known as the 61g flow, has shown no activity since lava drained from its vent in early May. 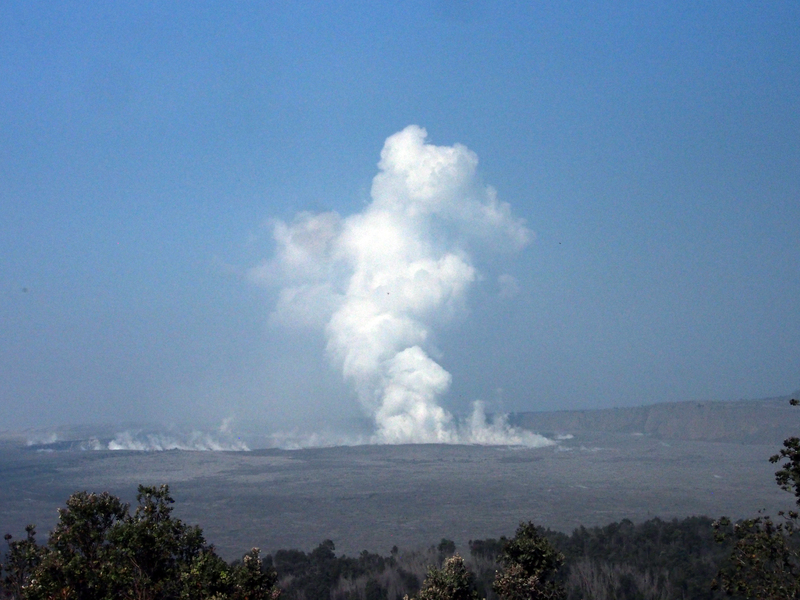 In the past week, intense eruptive activity has continued in Leilani Estates. 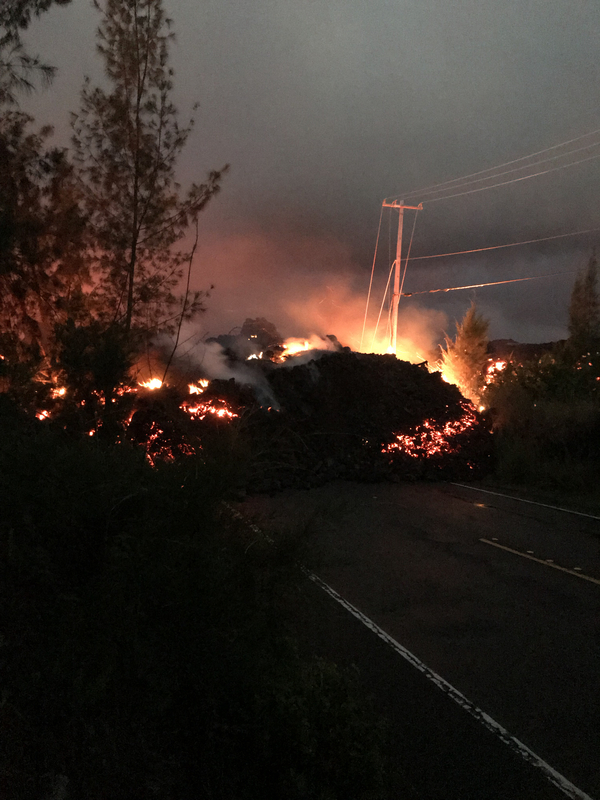 Fast-moving lava flows forced the evacuation of more residents from the area, including three people who had to be lifted out by helicopter after lava covered a highway and cut off access to some communities. The persistent flows also destroyed two buildings and buried two wells at a geothermal power plant. Citation: Loomis, I. (2018), Huge spike in quakes badly damages K&imacr;lauea observatory, Eos, 99, https://doi.org/10.1029/2018EO100529. Published on 05 June 2018.